I made a half recipe for each of the cakes. Then, I made a full recipe of the chocolate icing and a half recipe of the peanut butter icing. After the advice of my neighborhood taste testers, it was decided you have to make the full peanut butter icing recipe also. I totally agree. will beg you to make this again. 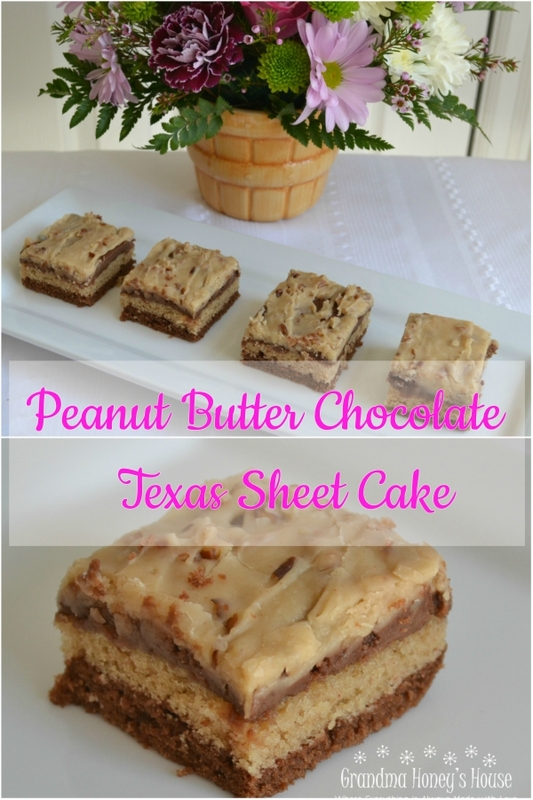 Start by making a half recipe of the Texas sheet cake. 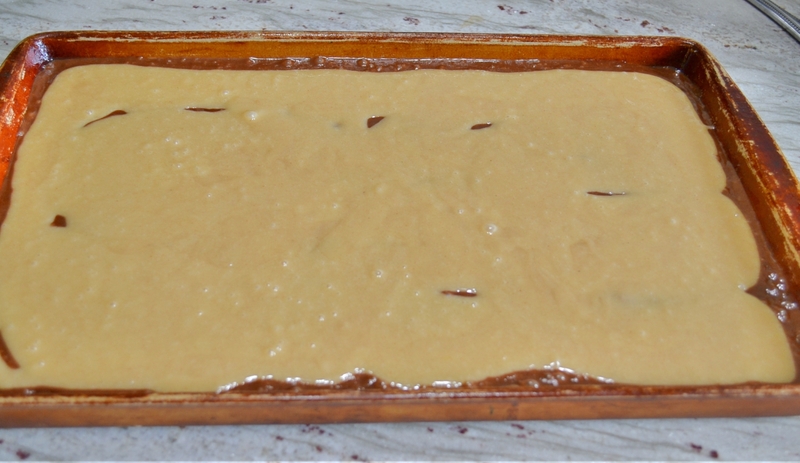 Spread in the bottom of a baking pan. I used my 11×17 inch stoneware pan from Pampered Chef. It looks very used because it has been, for many years. 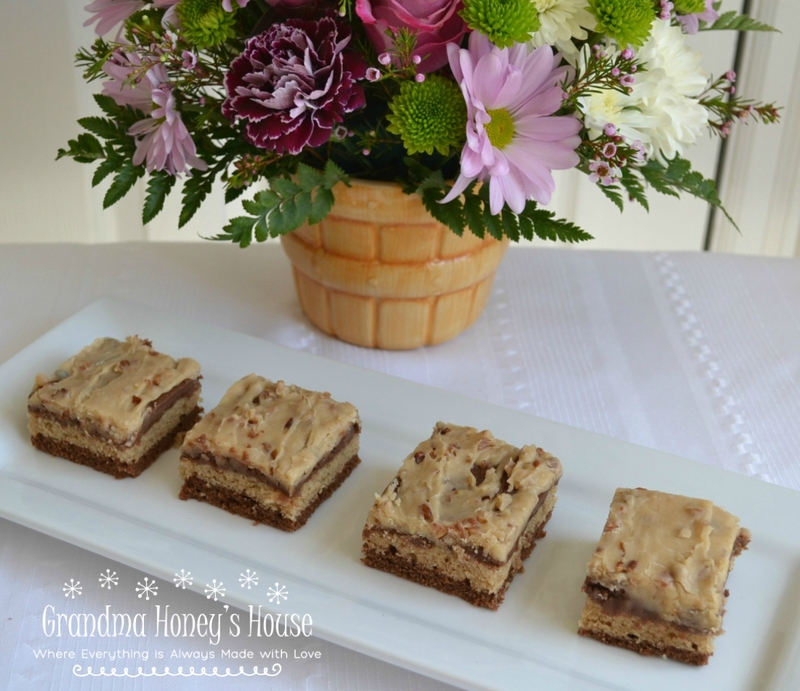 Prepare a half recipe of the peanut butter sheet cake. swirl it through with a knife, but worried that it would all turn to chocolate. Bake. My cake was done in 20 minutes. 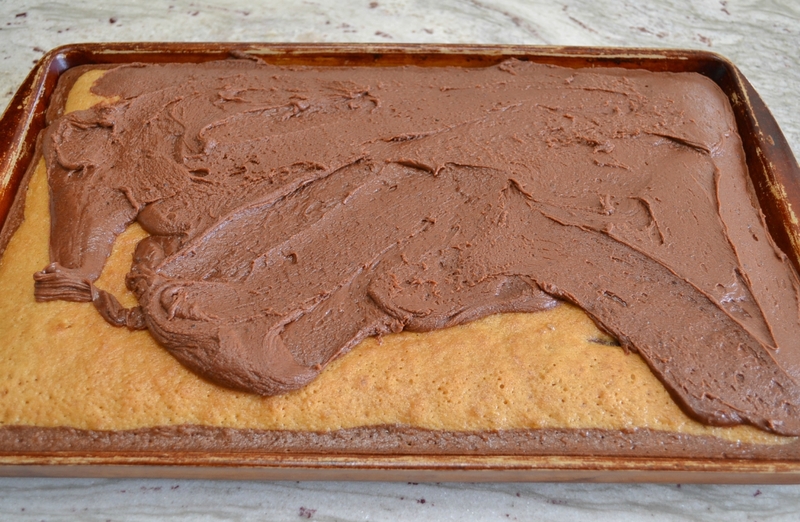 Prepare chocolate icing and spread over the cake while still hot. Frost the entire cake. 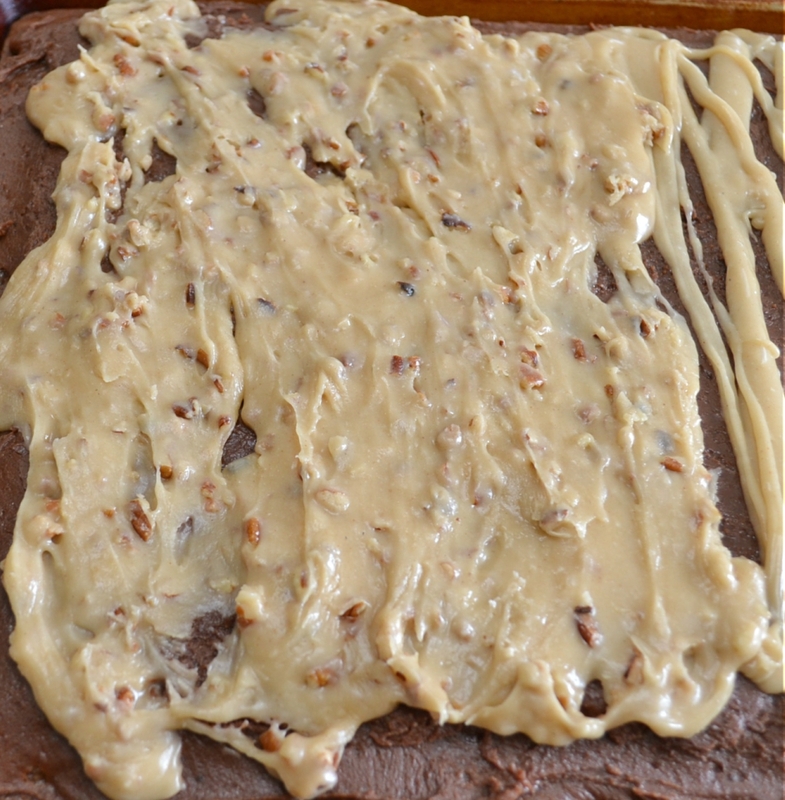 Allow cake to cool completely and cut into desired size squares. Don’t be intimidated by the ingredient list. for both cakes and frostings. 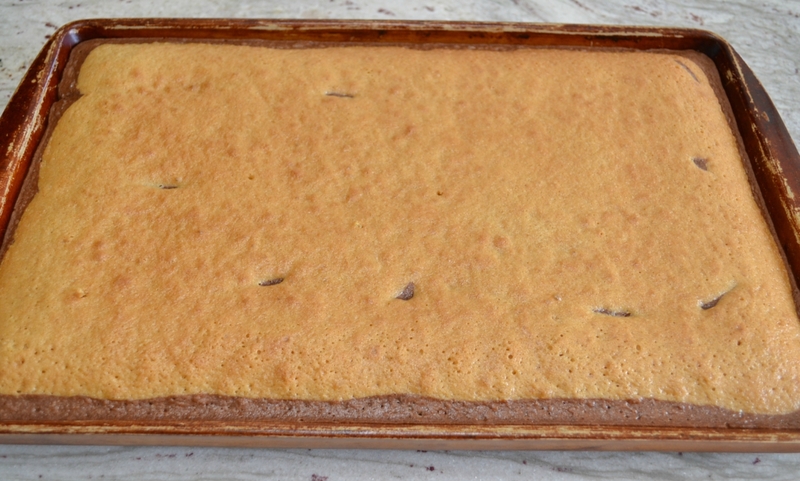 Preheat oven to 350 degrees F. Spray an 11 x 17 inch baking pan with no stick cooking spray. To prepare chocolate cake: Mix butter, oil, cocoa, and water together in a large saucepan. Bring to a boil. Remove from heat. Beat in the sugar and flour with an electric mixer. Whisk together the buttermilk, soda, egg, and vanilla. Beat into cake batter until well combined. Pour into baking pan. Prepare the peanut butter cake by placing peanut butter, oil, butter, and water into a large saucepan. Bring to a boil and then remove from the heat. Beat in sugar, flour, milk, egg, baking soda, and vanilla. Mix until well combined . Spoon or pour over the chocolate cake layer. Bake about 20 minutes, or until toothpick inserted into the center comes out clean. Prepare the chocolate frosting by placing the butter, milk, and cocoa into a medium size saucepan. Heat until it starts to boil, then remove from the heat. Beat in the confectioner sugar and vanilla with an electric mixer, until smooth. If frosting becomes too thick, add a few drops of milk at a time. Pour and spread the icing over cake while still warm. 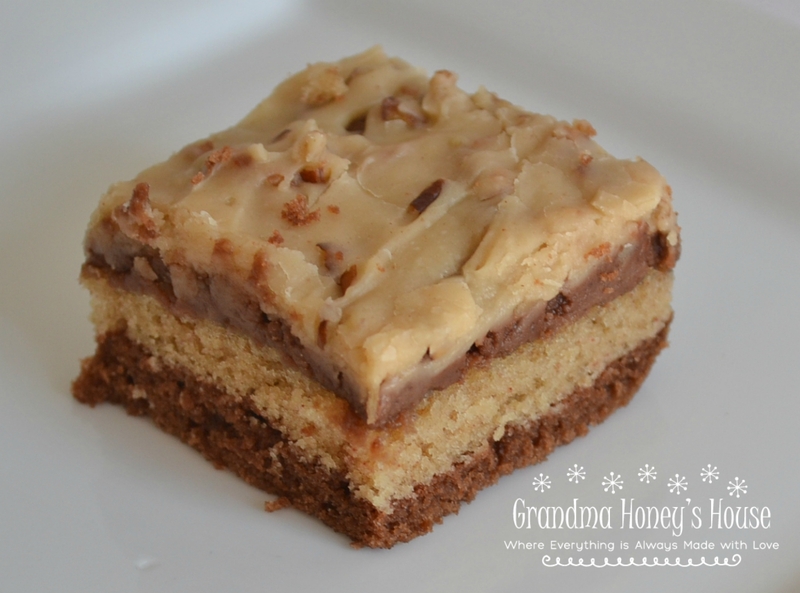 Allow icing to harden on the cake before preparing the peanut butter frosting. Oh my …… this cake looks amazing!!!! I just HAVE to try it!!!! Thanks for sharing this deliciousness, Pamela!!!! Thank you Susan. You are so sweet.